With so much Dark Knight-related news floating around, this might very well be the Year of Batman. Not only is it the 75th anniversary of Batman’s first appearance in comics, but he’s going to be all over screens in the coming months. There are already teaser images out for the 2016 Batman Vs. Superman film, plus Fox’s upcoming prequel drama Gotham. As if that wasn’t enough, it was recently announced that the entire 1960s television series is coming to DVD and Blu-ray! So it’s the perfect opportunity to take a look at Batman’s puzzliest foe, The Riddler. How do you divide seventeen apples among sixteen people? Make applesauce. There are three men in a boat with four cigarettes but no matches. How do they manage to smoke? They throw one cigarette overboard and make the boat a cigarette lighter. What has yellow skin and writes? A ballpoint banana. What suit of cards lays eggs? One that’s chicken-hearted. 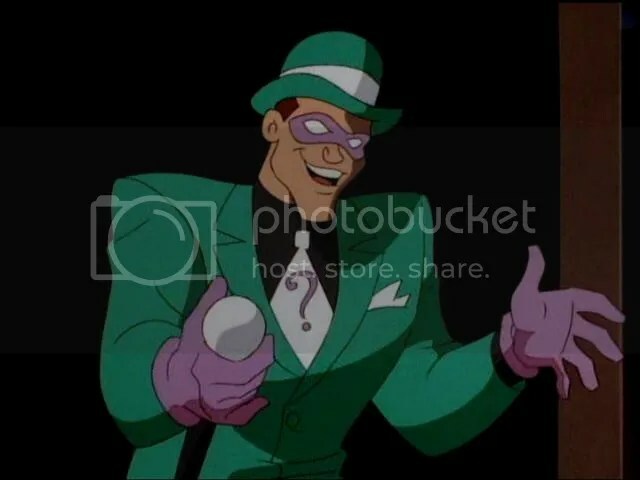 While Gorshin’s Riddler is probably the most famous and familiar version of the villain, my personal favorite was the Riddler in Batman: The Animated Series. This Riddler (voiced by actor John Glover) was more suave, sophisticated, and cunning. 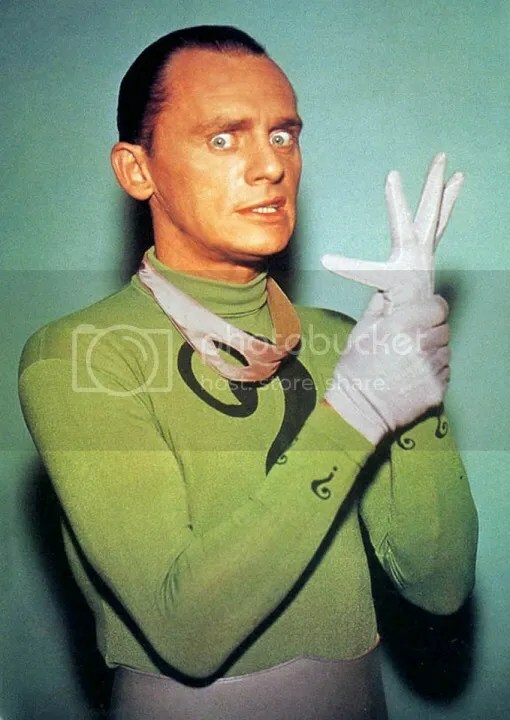 In his debut episode, entitled “If You’re So Smart, Why Aren’t You Rich?”, he challenged Batman and Robin with a boobytrap-filled labyrinth, complete with numerous riddles that were far more challenging than Gorshin’s Riddler would ever use. Fittingly, a final riddle — the Riddle of the Minotaur — awaits Batman at the center of the labyrinth. Can you solve it? I have millions of eyes, but live in darkness. I have millions of ears, but only four lobes. I have no muscles, but I rule two hemispheres. What am I? The human brain. This version of the Riddler only appeared a few times in the animated series, due to the writers’ difficulty coming up with his riddles and keeping his complex plots simple enough to fit into a single episode’s runtime. Nonetheless, this Riddler remains a fan favorite. 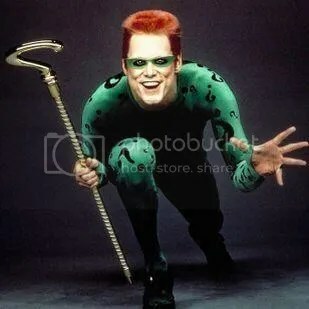 In the film Batman Forever, Jim Carrey actually gives us three versions of the Riddler: the scientist Edward Nygma (who definitely has a screw or two loose), the businessman Edward Nygma (a charming, public facade betraying none of his truly villainous tendencies), and the Riddler (a diabolical, borderline insane villain with an ax to grind with Bruce Wayne). Whether you like Carrey’s take on the character or not, he embodies an effective combination of Gorshin and Glover’s Riddlers. 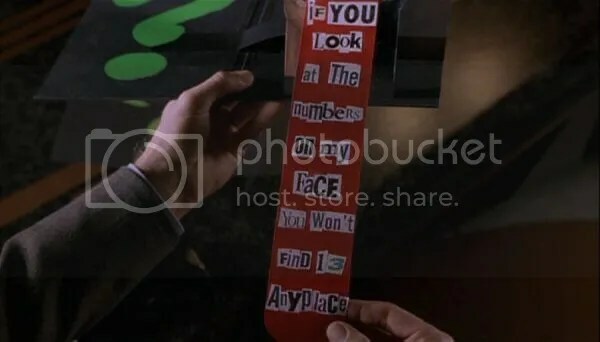 Of course, despite his bizarre plan to read people’s minds through television and become smarter by doing so, this Riddler had one advantage over the previous versions: he had puzzlemaster Will Shortz designing his riddles for him. While each riddle by itself meant little, except for providing a challenge to Batman’s intellect, all of them combined revealed the Riddler’s identity and set up the final showdown between the heroes and villains. As for the newest version of the Riddler in Fox’s fall premiere Gotham, we don’t know a lot about him, since this is set in the days before Batman prowled the streets. 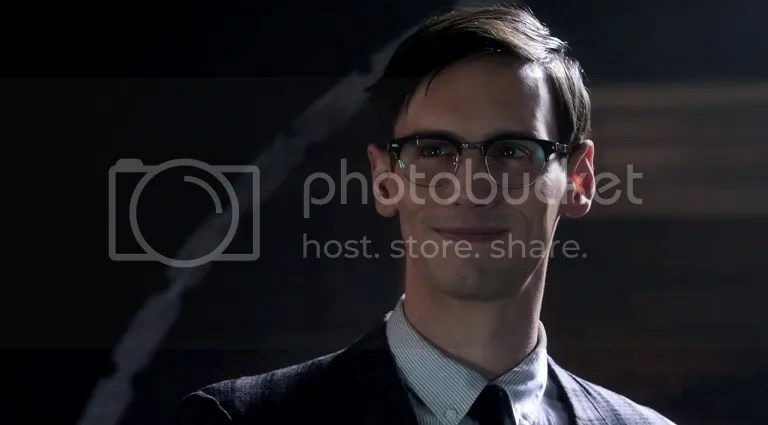 Apparently, the younger Edward Nygma (played by theater actor Cory Michael Smith) is a forensic scientist working for the police (who may formulate his notes in the form of riddles). Hopefully, this Riddler will carry on the fine tradition of Riddlers past, challenging the defenders of Gotham to outthink him, rather than outfight him. 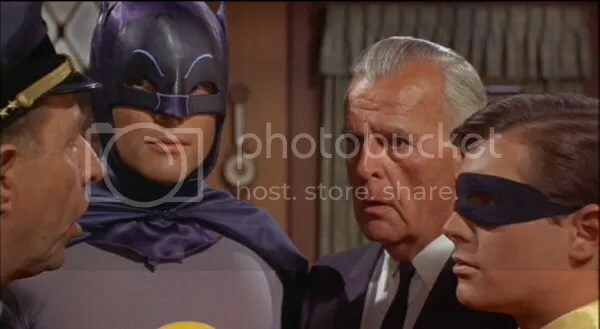 This entry was posted in Games, PuzzleNation, Puzzles and tagged 1960s, 60s, 75th anniversary, Batman, Batman 1960s, Batman Forever, Batman75, Batman: The Animated Series, Caped Crusader, comics, Cory Michael Smith, Dark Knight, Detective Comics, Fox's Gotham, Frank Gorshin, games, Geeking Out, Gotham, Jim Carrey, John Astin, John Glover, Pop culture, PuzzleNation, Puzzlin' fool, riddle, Riddler, Robin, the riddler, Will Shortz by gmdirect. Bookmark the permalink.